What are the rules in terms of number sizing and enforcement of said rule? Landracing Forum Home > East Coast Timing Association > ECTA Rules Questions (Moderator: Seldom Seen Slim) > What are the rules in terms of number sizing and enforcement of said rule? I wasn't allowed to go down the track because my numbers weren't 3 inches tall. The funny thing is the same guy who didn't let me run is the same guy seen below looking directly at a bike with numbers under the 3 inch rule. You can clearly see the guy looking right at the bike. So how exactly does it work? Who is allowed to run down the track with numbers under the 3" minimum and who isn't? Re: What are the rules in terms of number sizing and enforcement of said rule? I also have a comment about the number and class info display rules. In roadracing, the car/bike number needs to be large so that safety workers could call in issues to the officials if there was an issue requiring a black flag. In the pro series, having the number large is also important for fans. In LSR, we only have one vehicle on the track so the visibility of the number is most important for the starter who radios it in. The class information is very important to tech and to a lesser extent the start line folks. It is nice that fans can see numbers but there isn't much in the way of reference material for them to connect it to a team. I made an effort to make sure all my info met the rules but I see where this is especially difficult for folks switching classes on bikes. We have all seen the blue tape with the info written in a black sharpie. Not quite up to spec but I really hate to see someone sent packing for it. If we do enforce it, we need to be consistent. That means folks will need to buy sheets of the potential required info combinations if they plan to switch classes and/or add removable number plates. Don't want to ruffle feathers on this but I think the minimum size for the vehicle numbers should be lowered and that class info be sized for tape. I would to have all info in high contrast, i.e... black info on white or yellow tape. It is very hard to read black sharpie on dark blue. 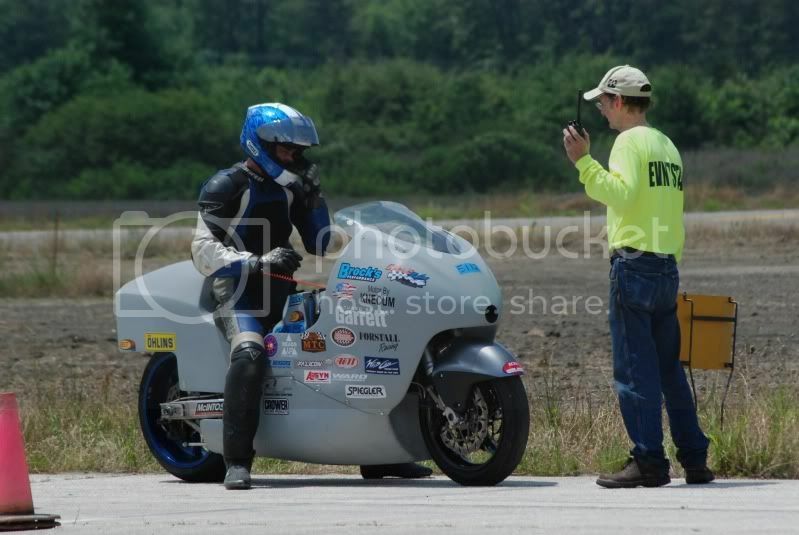 The starter, Mark doesnt tech motorcycles so I dont know how he could have kept you from going down the track ... He needs to read the numbers and relay them to Joe Timney in the tower for timing recording .... The goal at ECTA is to get everyone to safely compete .... no one would help you get the correct display? I'm sorry this happened Ali. All I can imagine is you may have had tiny or hard to see numbers. those are 2" numbers on my bike and if I realized it was a problem would have changed it instantly as I carry tape/marker in the tool bag. If you every need something at the line, please ask (many do) my tool bag has just about everything we all need. 100% About how YOU dealt with the issue. and had no problems either. how do you think that looks? How should the person singled out FEEL about that? How should others interpret said actions and inconsistencies? To say the issue had nothing to do the number sizing and was solely based on my reaction to said unjust actions on the part of the starter in my opinion implies that you don't accept certain fundamentals of life and how things really work. To me its about cause and effect. Would I apologize to said starter for getting upset after the fact? ABSOLUTELY, as I stated to you earlier if and only if said starter apologized to me first for admittedly singling me out. To sit here and say the issue is only about how I handled the situation is to turn a blind eye to inconsistent and unfair actions. Make no mistake sir, if the starter was able to read the numbers in the photo above he most certainly was able to read mine. In my opinion him pulling me out of line makes about as much sense as a janitor giving out detention slips. It completely undermines the tech inspection process and registration process and I think this opens up a dangerous precedent where one person can singlehandedly decide, on a whim, how things should and shouldn't be. In closing I will probably be in contact with Joe in the near future regarding this as thats about all I can do. The match directer is precisely that. I was not there; but I do know that in every type of competition I've entered, respect for officials is of up most importance and more than adequate grounds for ejection regardless of cause. You are a really nice guy and hope this will be resolved, for we are a "family" and issues do and will arise. Relaxedphit, thanks for your input. I hear what you are saying. Just a little off in the presumption department as the janitor reference was made in essence to state that it isn't the person's job. Every position at a track is of equal importance in my opinion from tech inspector to starter, you need it all in order to flow smoothly. There was absolutey NO safety issue with my bike while on the starting line. It isn't like the starter couldn't actually read my numbers, he absolutely could. And if one were to assert that he actually couldn't read my numbers then I would argue that vision as compromised as such would compromise the ability for the starter to act as an effective "final step in the complete tech process", as you mentioned. I (pre)paid my money just like many other racers. I stood in line patiently to get teched in like many other racers. The race director Keith Turk himself signed off on my tech inspection. I stood in a fairly long hot line in leathers like many other motorcycle racers and patiently waited my turn. I had numbers on my bike that were under 3" like many other motorcycle racers that day, but unlike any other motorcycle racer only I was pulled off the starting line for it. I'm fine with a 3 inch rule so long as its enforced across the board. But to see other motorcycle racers run with illegal numbers RIGHT AFTER I WAS PULLED for it...well....again.....how should one feel about that? I can understand your being upset at being singled out. What I dont understand is why you would come to the races with under sized numbers. My numbers are 4" and my class letters and numbers are 2". Everything is bigger than the minimun requirement! I have been going to Maxton for 5 years with no issues. Never knew it was a problem, I just copied what others said was ok and never had a problem. ECTA 2010 rulebook, page 71, section 7.B.1 -- states letter and number size requirements. . .pretty clearly. If you're a paid member -- you've got a rulebook. slim, he knows that the size is part of the issue; what you and others aren't getting is that other racers (according to him) were able to run with similar size letters and numbers. If that was the case the other riders should have not been able to run either. I know about the issue -- was just quoting where the rule is so that he can't say he didn't know about it. Whether others get away with something on which he was called is beside the point. Was it some type of favoritism -- or just the starter having a bad moment and Ali (a/k/a Shiphteey) got caught in a crosswind? I didn't inspect his bike -- but now that I'm aware of the apparent inequality I guess it's time for the inspectors to more stringently enforce the letter/number size rule -- or come to an agreement on how much laxity will be allowed.